Wilson signed with Epic Records in 2003 and recorded Here for the Party within the year. Her first single, "Redneck Woman", was released in early 2004 and reached the top of the Hot Country Songs charts and No. 22 on the Billboard Hot 100. This song was also the first Number One country hit by a female in two years. The success of "Redneck Woman" prompted an earlier-than-planned release for Here for the Party, and it debuted at No. 1 on the Billboard country chart. It reached No. 2 on the Billboard 200 and Billboard Internet album sales charts. She performed as a support artist for Brooks & Dunn and Montgomery Gentry. She released the title track to her debut album as the second single. It peaked at No. 3 on the Billboard country chart. Two other songs were released as singles, and both reached the top 10. Released in markets outside the U.S., the album hit No. 2 on the Australian country charts (behind Kasey Chambers) and the top 50 of the Australian charts. Here for the Party was certified 5× Multi-Platinum by the RIAA. On September 27, 2005, Wilson released her second album, All Jacked Up, which peaked at No. 1 on both the Top 200 and Country album charts and sold 1 million copies. The title track debuted at No. 21 on the Hot Country Songs charts, setting a record for the highest debut ever made by a female artist. This record was broken in late 2007 by Carrie Underwood's "So Small". Despite its high debut, however, "All Jacked Up" peaked at No. 8 on Hot Country Songs after only eight chart weeks. It was also used, at one time, by ESPN as the opening theme for its baseball coverage. Three more singles were released from All Jacked Up: "I Don't Feel Like Loving You Today", "Politically Uncorrect" (a duet with Merle Haggard) and "California Girls", none of which reached Top 20 on the country charts. These latter two singles were issued on Columbia Records, due to the closure of Epic Records's Nashville division. Wilson's "I Don't Feel Like Loving You Today" was nominated for two Grammy Awards: Best Female Country Vocal Performance, and Best Country Song. In 2006, Wilson contributed a well-received cover of Kris Kristofferson's "Sunday Mornin' Coming Down" on the tribute CD The Pilgrim: A Celebration of Kris Kristofferson. On May 15, 2007, Wilson released her third album, One of the Boys. The album debuted at No. 5 on the Top 200 and at No. 1 on the Country album chart. After 10 weeks, it exited the Billboard Top 200, having sold 178,220 copies at that point. "Come to Bed" (a duet with John Rich) and the title track, the first two singles released, both peaked in the 30s on the country charts, while the third and final single ("You Don't Have to Go Home") failed to reach the Top 40. On July 14, 2008, Wilson released a new single, "Don't Do Me No Good". This song was intended to be the lead-off single to a fourth studio album, but it failed to reach the Top 40 and the album was delayed. It was followed in 2009 by two more singles, "The Earrings Song" and "If I Could Do It All Again," neither of which entered the charts. Wilson then issued a press release on July 28, 2009, stating that she would be parting with Sony Music Nashville. Wilson then launched Redneck Records, her own record label. "Work Hard, Play Harder" was released to radio on October 26, 2009 as the first single from the label and her fourth studio album, I Got Your Country Right Here, was finally released on March 30, 2010. Her former label, Columbia Nashville, released her first Greatest Hits album on January 19, 2010, to finish off her recording contract. Wilson released an album of original songs titled Right on Time on April 2, 2013. It was led by the single "Still Rollin'". A collection of rock covers titled Under the Covers was released on June 4, 2013. Wilson released her first Christmas album, Christmas in My Heart, on October 8, 2013. While a country singer first and foremost, Gretchen Wilson has also attracted favorable attention for her rendition of classic rock songs by Heart – a group which she sees as "one of the biggest influences on my musical career". She has appeared several times on the same stage as lead singer Ann Wilson and guitarist Nancy Wilson, once describing the experience as "beyond a dream come true". She has sung "Straight On", "Crazy on You", and – most notably – "Barracuda", which she performed with Alice in Chains and Nancy Wilson on guitar at the 2007 VH1 Rock Honors. She also performed, with Randy Bachman, the classic Who track "Who Are You" on the album Who Are You – An All Star Tribute To The Who. She performed on Buckcherry's single "The Feeling Never Dies" (from the album Rock 'n' Roll), which was released January 29, 2016. Gretchen Wilson sang the National Anthem (blended with a voice-over of the Pledge of Allegiance) to a national audience at the Republican National Convention on September 3, 2008, later describing this as a "once-in-a-lifetime" experience at a "historic moment." Wilson and her band also performed during a rally for Republican presidential candidate John McCain and vice-presidential candidate Sarah Palin at Lunken Airport in Cincinnati, Ohio on October 22, 2008 to a crowd of approximately 12,000 supporters. Palin started the rally by exclaiming that she couldn't wait to get Wilson's autograph. Wilson played a version of the Heart song "Barracuda" for Palin. (1) Raising over $1.5 million through benefit performances for children's charities, such as St. Jude Children's Research Hospital and the Make-A-Wish Foundation. (2) Serving as national spokesperson for Country Bands Together, a national obesity education and counseling/support campaign sponsored by Allergan. (3) Advocacy for adult education, including testimony before Congress on the value and importance of support for adult learners. Wilson dropped out of high school while in 9th grade but gained her GED in 2008 through an adult education college. In April 2010, Wilson released a customized version of "Work Hard, Play Harder" in honor of the National Hockey League's Nashville Predators, with reworked lyrics mentioning the team and its fans. She also sponsors a women's softball team in Pierron, Illinois. On July 31, 2008, The Black Crowes filed a lawsuit against Wilson for copyright violation, alleging that her song "Work Hard, Play Harder" copied the Crowes song "Jealous Again". Also included in the suit were her label Sony BMG, her publishing company, and the cable network TNT, which had been using the song in commercials. The lawsuit was eventually settled out of court for an undisclosed sum  and Black Crowes members Chris and Rich Robinson were given songwriting credits. On August 21, 2018, Wilson was arrested at Bradley International Airport in Windsor Locks, Connecticut. Connecticut State Police arrived at the airport after reports of a minor disturbance. Police arrested Wilson after she reportedly became belligerent during their on tarmac interview. Wilson was charged with breach of peace and her bond was set at $1,000. ^ a b c Ruhlmann, William. 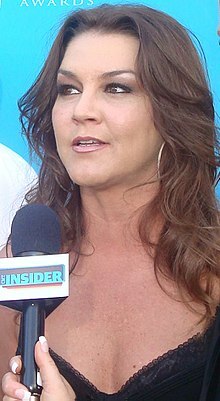 "Gretchen Wilson biography". Allmusic. Retrieved 2008-10-06. ^ "Gretchen Wilson, Sony Music part ways". CMT. 2009-07-28. Retrieved 2009-07-28. ^ "Christmas in My Heart – Gretchen Wilson". Allmusic. Retrieved August 11, 2013. ^ "Wow Gretchen Wilson does a cover of Heart!". Tdpri.com. Retrieved 2011-12-10. ^ a b "GRETCHEN WILSON Heart's 'Straight On' LIVE w/JOHN RICH". YouTube. Retrieved 2011-12-10. ^ "westcoastmusic: Gretchen Wilson (Country Music female artist) Jams With Heart". Noted.blogs.com. 2004-12-12. Retrieved 2011-12-10. ^ "Gretchen Wilson & Alice in Chains – Barracuda". YouTube. Retrieved 2011-12-10. ^ "Who Are You – An All Star Tribute To The Who". AllMusic. Retrieved 2015-01-10. ^ Buckcherry (27 January 2016). "Buckcherry - The Feeling Never Dies feat. Gretchen Wilson [Audio]". Retrieved 19 March 2018 – via YouTube. ^ "Gretchen Wilson describes 'surreal' convention performance – Entertainment, Music". Army Times. Retrieved 2011-12-10. ^ "Palin, McCain Rally At Airport", USA Today, October 23, 2008. ^ blakegrant (2010-04-22). "Play Harder Predators Edit". YouTube. Retrieved 2011-12-10. ^ Serpe, Gina (2008-07-30). "Black Crowes Caw Out Gretchen Wilson for Alleged Song Stealing". E! Online. Retrieved 2008-07-31. ^ Kelli Skye Fadroski. "Gretchen Wilson battles (and gives) back". Ocregister.com. Retrieved 2016-01-04. ^ Simbeck, Rob. "Redneck Woman Gretchen Wilson's search for radio redemption | Cover Story". Nashville Scene. Retrieved 2016-01-04. ^ Pollnow, Corey (August 22, 2018). "Country music star arrested at Bradley airport". Eyewitness News Channel 3. Retrieved August 22, 2018. ^ "Gretchen Wilson : Awards". CMT.com. Retrieved 2011-12-10. ^ "GRAMMYS 2005 : Nominees". VH1.com. Retrieved 2011-12-10. ^ "2005 Grammy Award Winners". CBS News. February 14, 2005. ^ a b "GRAMMYS 2005 : Nominees". VH1.com. Retrieved 2011-12-10. ^ a b c d e ; Written by Craig Shelburne (2005-12-08). "News : Paisley, Wilson Earn Four Grammy Nominations Each". CMT. Retrieved 2011-12-10. 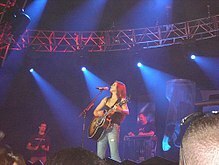 Wikimedia Commons has media related to Gretchen Wilson. This page was last edited on 2 April 2019, at 02:40 (UTC).